If you have to rank, rank often -- and everyone is a winner. Economics departments get ranked too, and everyone has a ranking they like. Not entirely by accident, it will probably show that your own place is doing well. Tilburg U runs one of the more respected exercises, and the results for 2005-08 are in. 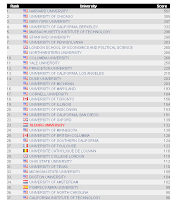 UPF Economics ranked 35th in the world (31st if you only look at top 5 journals); in Europe, we were 8th, behind LSE, Tilburg, Louvain, Oxford, Amsterdam, and Toulouse, but ahead of Cambridge, Tel Aviv, Bonn etc. The ranking only counts publications until 2008, and I am sure that 2009 will help us yet further.